Just about every time I open a magazine or flip through the ads in the paper, I am met with images of women in their underwear. Really, it's hard to not notice that there are an overabundance of options for us when it comes to what we're going to wear under our clothes. But, up until recently, I hadn't really thought about the choices that men have when selecting their own undergarments. Compared to all of the women's cuts, styles, colors and fabrics, men seem to have briefs, boxer shorts and boxer briefs that are pretty much all the same. Sure, the satin boxers have a stronger showing around Valentine's Day, but basically men just put up with the way that their traditional cotton underwear stretches out, retains moisture or comes untucked. After years of living with all of that bunching, sagging and all-around discomfort, Greg Hall decided enough was enough. In 2009 he founded Slix... and the world of men's underwear has never been the same. Knowing that athletic stores offered garments for men that utilized performance materials, Greg decided to design pieces that would provide the versatility to meet the daily needs of an active professional. As well as being functionally superior to cotton, he wanted his products to be appropriate to wear no matter what today's modern man wore during the day - office attire, jeans, shorts, workout clothes and more. So... are they really all that different from the norm? Just from opening the package of Slix Closer Boxer Briefs, I was already impressed with the feel of the smooth, soft fabric. Giving them a few tugs, I could see that the Closer had some give but would also be able to provide a strong, tight fit. Passing them over to my husband, I was interested to see if they would help put an end to his past underwear complaints. Instead of having to continually buy new ones due to worn out elastic or loss of stretch, could these really "fundamentally enhance his comfort and performance" like Slix claimed they would? In a nutshell, yes. 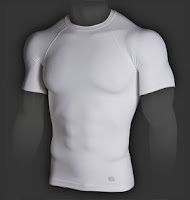 My husband has worn the Closer Boxer Briefs multiple times and admits that they not only stay in place well, but that the breathability and wickability are indeed better than what is found in stores (whether from a designer label or generic). Sounds like a winner! Slix undergarments do cost slightly more than the average items out there (the Closer and their two fitted undershirts retail for $24 each), but if they are going to fit a man's active, professional and personal lifestyle by being superior products, they're a good instance of proving that you indeed do get what you pay for. 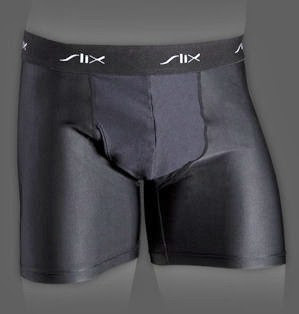 One lucky person will win a pair of Slix Closer Boxer Briefs! ARV $24! Professional golfer John Daly not included. To enter to win: Visit Slix and tell me the name of one of their other products that you think the man in your life would like to try. 1 Extra Entry (per method) if you follow Slix on Twitter and/or Like them on Facebook. 3 Extra Entries if you blog about this giveaway linking back to Thanks, Mail Carrier and Slix. Please leave an address where it can be found. 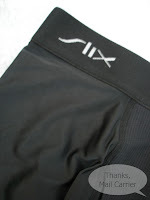 A big thank you to Slix for providing Slix Closer Boxer Briefs for review as well as for one lucky giveaway winner. This review was made possible due to my membership in the Double Duty Divas. The opinions shared are my own and honest and if you really need to see more, click here to see how I roll. Thanks for the follow, I am now following back! Those super hero caps and masks are great by the way! I think my husband would like the Slix Downsizer. I entered the Maukilo giveaway. I entered the Flip MinoHD giveaway. I entered the BabyPop Designs Custom kids Superhero Cape and Mask giveaway. put your button on my new blog! the "movers" socks look soft and comfy! My hubby is military and is told what to wear about 95% of his time. The only thing he really could wear are the Closers. However I think he might like the Influencer. I think my husband would like to try the Slix Movers socks. my hubby would like the influencer. hope i win these undies for him! Thank you for following my blog! I am stopping by to visit and following you back to say "hello!" Love the hero masks! Wish my kids were young again to wear those. Will stop by again! I just followed you on Twitter. I am MyScratchOff. I also put giveaways on my blog so I am intersted to see your giveaways. Also this one I can use to look good lol! My boyfriend would love the Slix Downsizer! I think my husband would also like the Slix Movers. I think he'd like to try the Slix Movers socks. My husband would like the Slix Influencer. My husband would like the Slix Movers socks! I think my husband would also like the Slix Influencer. Entered Melissa & Doug Giveaway.